It’s been a couple of years since I’ve used a Motorola phone that I could confidently recommend to a friend (RIP Moto X 2013). Today, that sentiment changed when I picked up the new Moto Z Play Droid and its funky camera attachment that magnetically snaps onto the back of the phone, called the Hasselblad True Zoom Mod. The Moto Z Play is practically the same as the Moto Z we reviewed back in July, but this time around, Motorola made one critical tweak: the company included a headphone jack in this new model. In the earlier version, Motorola got rid of the 3.5mm jack to save space and keep the phone thin, so it wouldn’t get too bulky when you attached any of the mods. The Moto Z Play ditches that logic for something more practical. I use my 3.5mm jack (and fancy headphones) daily, so I’m glad that Motorola decided to bring it back in this model. One major similarity the Moto Z Play has with the other version released earlier this year is that it includes a 16-pin metal strip on the rear of the phone. The strip allows a series of different mods to be magnetically attached to the phone. One of the most highly anticipated mods is the camera attachment. The attachment—called the Hasselblad True Zoom (yeah that Hasselblad)—is a thin, phone-sized optical camera that latches onto the back of the phone when pressed against the back. The camera attachment gives the phone the ability to take pictures from far away, with a 10x optical zoom and xenon flash—things you’d typically only find in a point-and-shoot camera. The attachment also has a physical shutter and takes photos in RAW format, which is a huge plus for anyone that wants to take professional grade photos while their out on the town. The camera is great—but it’s also pretty damn impractical. 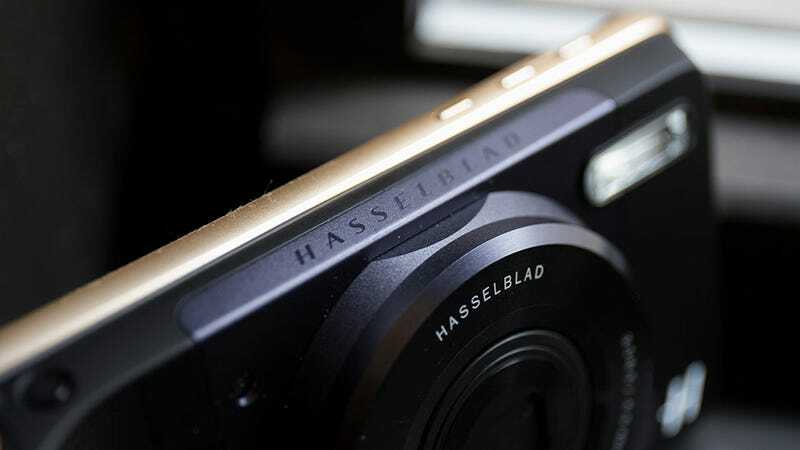 Carrying around the Hasselblad True Zoom camera would be the equivalent of carrying two phones around in your pocket. Plus, as good as its sensor is, it would never match the quality of a high-end DSLR or even mirrorless camera. The level of detail just isn’t there. What the Hasselblad would actually be good at is helping you take ridiculously pristine photos for Instagram or any other web services. The photos would be a little sharper and more detailed that your average phone photo, especially if you’re using the optical zoom. But would even the most popular Instagram users bother to use this thing? My guess would be no. The Moto Z Play Droid is available at Verizon stores starting September 8 for the price of $408 (which is a pretty solid deal when you consider phones like the Note 7 cost $850). The Hasselblad True Zoom is also available at Verizon stores on September 8 for $250—way too expensive for something this impractical with rather poor performance in low light settings like a stuffy office. The idea is cool, but this version just isn’t quite what we’ve been looking for.